While buzz continues to grow around Nintendo’s first and future mobile outings, I’m still playing The Pokémon Company’s inaugural mobile title Pokémon Shuffle almost daily. If you’re as addicted as I am, you already know how good it is. If you’ve yet to be converted to the Church of Shuffle, allow me to dunk your head in the baptismal font. Pokémon Shuffle launched in 2015 for 3DS, iOS, and Android, and as far as I know it hasn’t really been tearing up the download charts. And understandably so, because at first glance it’s just a match-three-or-more game with Pokémon instead of jelly beans or gems or whatever people are placing in a row on their phones these days. But what you may not realize is that the Pokémon themselves are what makes Shuffle so unique. In Pokémon Shuffle, you proceed from stage to stage playing a familiar game of match-three, dragging colorful pocket monsters here and there to reduce the HP of an enemy ‘mon in a set number of moves. Matches do more or less damage depending on the level and type effectiveness of Pokémon in the stage, and the faster you can defeat an enemy Pokémon the better your high score and rank will be. Each puzzle is a battle, and each stage completed will give you an opportunity to catch the Pokémon you just faced. When you select a stage, you also select a specialized four-Pokémon team to tackle it. So, if you’re having trouble beating the Electric-type Dedenne or achieving a better score or rank on its stage, go catch a Ground type like Cubone and level it up. Or, you could head into Dedenne’s stage and trigger a Mega Evolution for one of your team members to clear larger swaths of the board. You can even buy items with in-game currency to give your team a temporary advantage. There’s a metagame here that draws heavily from the main series’ core gameplay, and as a longtime Pokémon fan that’s a huge part of its allure for me. 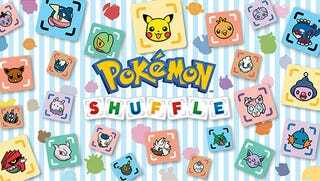 Shuffle isn’t just Candy Crush with Pikachu in it; it’s Pokémon as a matching game instead of a JRPG—and it works! That being said, the grind is real. You will revisit stages multiple times to level your weaker Pokémon, and sometimes you might even just throw yourself against the exceedingly difficult trainer battles just for little handouts of EXP. However, the latest update for mobile devices, Version 1.6, has added lots of features to make replaying stages more worth your time. In addition to a new friends list that doesn’t require Facebook integration (thank God), developer Genius Sonority has added challenge cards that reward players who complete stages under new restrictions. On top of all of that and the opportunity to catch over 388 unique Pokémon (and counting), the app is updated daily with limited-time battles featuring legendary and rare monsters. I find myself grinding in the main game just to be ready for when Mew or Darkrai appear (the latter of which still eludes me). It is worth noting that Shuffle is a freemium game, so while in modern Nintendo fashion it doesn’t shove microtransactions down your throat, the option still exists to purchase extra playtime. To its credit, though, the game is very generous with its Hearts (the in-game play tokens) and they refill every 30 minutes. While I haven’t spent a dime, I would if there were more to buy than Hearts and Jewels that just give you temporary boosts. Genius Sonority, take note: let me buy a batch of Great Balls and you’ve got my money! If you like Japanese pocket monsters and you like matching things and watching them disappear, I highly recommend Pokémon Shuffle. Miitomo ain’t got nothin’ on this.